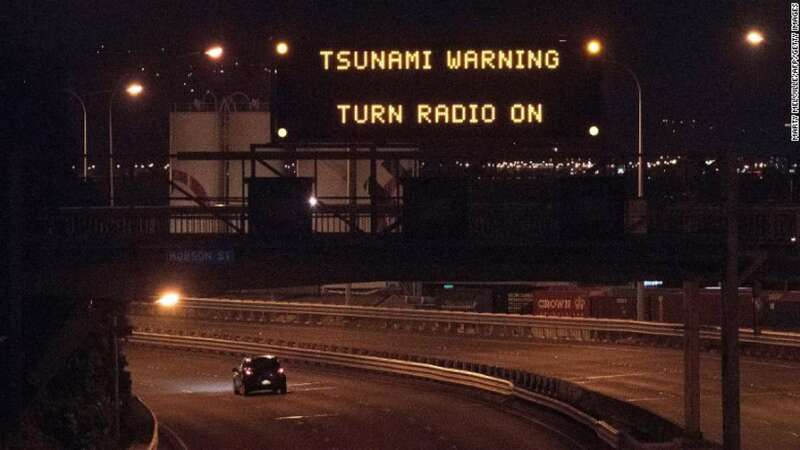 Los angeles : New Zealand faced a major earthquake measuring 7.8 magnitude on Richter Scale just after midnight which also generated warnings of a tsunami in the coastal regions of South Islland. According to US Geological Survey, the quake struck at 12:02 a.m and was only 10 kilometres deep and felt throughout most of the country. A series of aftershocks were recorded around the country, some as strong as 6.1 magnitude. They added that a gauge at Kaikoura, 181 km north of Christchurch, measured a wave of two metres. Smaller waves are expected to be arriving in Wellington and other areas. The Civil defence authorities have warned the residents in the Chatham Islands, an archipelago 680 km south-east of the mainland, of a wave that would hit imminently. Earlier, residents along the country's entire east coast and in low-lying areas were urged to evacuate and seek higher ground. Officials suggested that the first waves may not be the largest but the tsunami activity is possible for several hours. However, the Pacific Tsunami Warning Centre explained that on the basis of available data “a destructive tsunami is not expected. The quake was centred 91 km (57 miles) north-northeast of Christchurch, the biggest city on New Zealand's South Island. A 6.3 quake there in February 2011 killed 185 people and caused widespread damage.